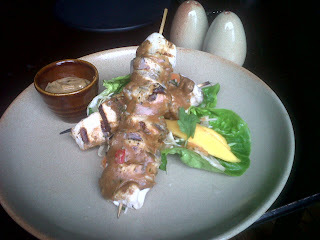 I love the distinctly Thai flavours in this light but very spicy, Thai style chicken skewers. This recipe works perfectly on a b.b.q, but it also taste great simple cooked in a pan. The satay sauce is a sauce I learnt how to cook while living in Thailand. There are so many variations of satay sauce but I find that this Thai version has such a depth of flavour that cannot be matched. The flavours in the dressing should be a perfect balance between spicy, salty, sweet and sour, for that true taste of Thailand. Blend the curry paste with the peanut butter together. In the wok heat the coconut milk with the oil over high heat until it splits and starts to bubble, add the paste and cook for 10mins or until very fragrant, your nose will tell you when it’s ready. Add the sugar and continue to cook until completely melted. Heat 3tblsp of the oil in a wok and add the shallots, paste, ginger and chillies fry over medium heat and cook until the paste smells very fragrant. Add the sugar and the vinegar and cook to a light syrup. Cut chicken into 5cm dice. Add to marinade and turn to coat all over. Cover and refrigerate for 30 minutes or overnight. Drain chicken. Reserve marinade. Thread the chicken pieces onto the soaked wooden skewers. Heat oil in a grill pan. In two batches, add skewers and cook on a medium heat, turning occasionally, for about 10 minutes or until cooked through. To serve place all of the salad ingredients into a bowl and mix well. Add 4tblsp of the dressing and mix well. Place chicken skewers onto of salad and pour a little satay sauce over the skewers. Serve extra satay sauce on the side.